4 podiums in a row - and 4 races to go. Kimi Räikkönen's stocks have gone up a lot lately in the international F1-media. The finnish driver has been praised for being even and for the flawless performances that have enabled Ferrari to stay in the picture. What do my fellow reporters expect from Kimi and Ferrari? Will the chain of trophies continue and for how long? – I believe that there will be one more. In Singapore Ferrari should have good chances if Kimi continues in this style. There Brawn, Red Bull and McLaren will go fast but like we have seen in the last races, they don't seem to get things together at the same time. That's where Kimi's chances to the podium are. – But Suzuka – there Ferrari has no business to the top other than under extremely exceptional circumstances. – I believe that Kimi's success will continue for as long as Ferrari does things the best way they can meaning having a clear driver number one and a clear driver number two. We saw how well it went for the last 12 years. When Michael Schumacher retired they put Kimi and Massa together, broke all the rules they had during Michael's time. After that the team didn't work very efficiently. I'm not claiming that Massa wouldn't be a good driver, he is, but Ferrari functions better when it operates around one driver. They do it at McLaren now when they have Lewis and Heikki. – Now Ferrari has Fisichella. Kimi is the better driver and in Ferrari it works just like before again. The car won't be developed but it means in practice that they won't do anything massive because it's no use when thinking of the time. Ferrari does better by concentrating on one driver. I believe that Ferrari would have a better next season if they had Kimi and Fisichella or Massa or Massa and Alonoso or Kimi and Alonso. – It looks good. The cars haven't been developed. These three races have been completely up to Kimi. Kimi keeps it floating and has a good spirit on. Now he is like the normal Kimi. Really great. I guess Kimi is more relieved now that Massa is absent. – I agree with Windsor. When you are driver number one, it works. I know it from my own experience in that team about 10 years ago. – Kimi can well be on the podium in Singapore too. There he can rectify the job with his glove. 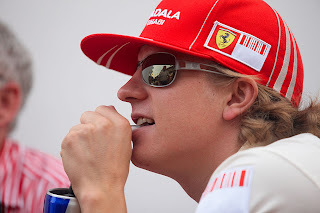 – I can't see Kimi winning again but the season is strange. It feels like Brawn and Red Bull don't succeed in the same race. That's why Kimi doesn't have to win both of them in the same day. It will ease Kimi's chances in the future to be in the top 3. – It will be more probable that Kimi will take some trophy than that he wouldn't. Ferrari isn't the fastest car but Kimi is at the moment the most consistent driver when everybody else seems to have some kind of rollecoaster. – Singapore is going to be quite a gamble. You can have a good opportunity there. On top of that I have the feeling that Kimi is fast in Brazil at least.